This will be the third season that I am supported by the Dave Rayner Fund. I really appreciate the continued support from everyone involved. I have been competing in races since I was 10 years old but from the age of 14 I joined De Ver Cycles and gained selection for the British Cycling Youth Talent Team Programme. As a Junior I achieved 4 top 10's in the National road race series and several podiums in Belgium and the Basque Country. Representing Scotland at the Youth Commonwealth Games was also a highlight. I spent my first year as an under 23 racing in the UK, Belgium and the Basque Country, gaining vital experience to take forward and learn from. Since then I have been based in Belgium, racing for CT Tomacc for 3 seasons before moving to Baguet-MIBA-Indulek-Derito Cycling Team last year. This is now my fifth season racing in Belgium and I can't get enough of the races here. I have progressed noticeably during my time spent in Belgium on and off the bike, I love the experience of living abroad and take all that I can from every aspect of life as a bike rider in Belgium to become the best I can be. 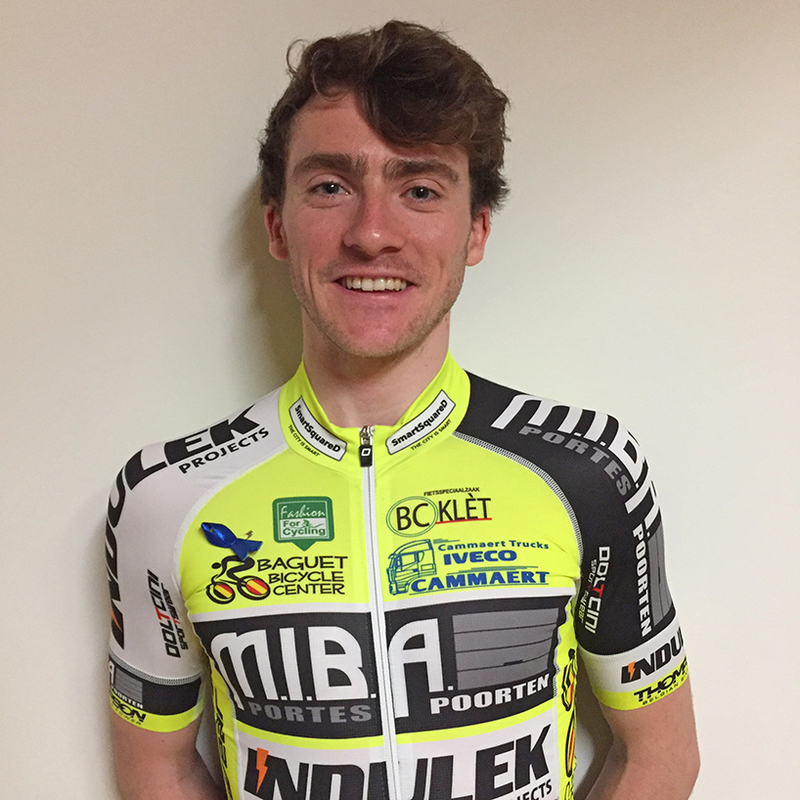 I'm back with Baguet-MIBA-Indulek-Derito Cycling Team for a second consecutive season, an ideal choice for me, they have a great calendar of racing, friendly faces and valuable support. The team races at Top Competition level and is based in East Flanders. The team is made up of approximately 25 riders with the majority Belgian with around 7 foreigners (3 Brits, 2 Americans, 1 Brazilian and 1 Norwegian). We have a really strong race calendar this year with several UCI 1.2's and a couple of UCI 2.2's as well as Interclubs on an almost weekly basis then entry into any Pro or Amateur Kermesse. We will be riding Thompson Capella bikes with our clothing supplied by Doltcini. I've always followed football pretty closely otherwise my interests are generally hanging out with my girlfriend, family and friends. Love getting stuck into an addictive TV show!